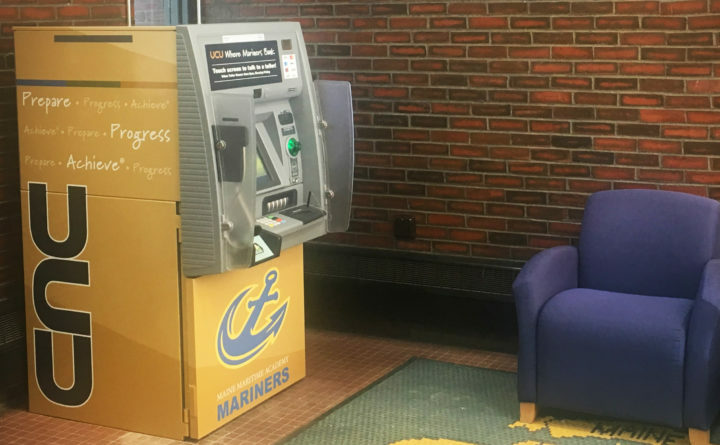 CASTINE, Maine (March 15, 2018) – University Credit Union expanded its statewide fleet of advanced interactive video teller machines (ITMs) with the opening of an ITM in Curtis Hall on the Maine Maritime Academy campus. Combining advanced video technology with the classic ATM design, UCU’s video teller machines provide its members with convenient access to a range of UCU services without sacrificing the personal experience of a branch visit. During regular business hours, members can speak with a real UCU teller and complete transactions via video chat, just as they would in-person at any UCU location. Available services include: account deposits, withdrawals (including small bills and coins), transfers, check cashing, balance inquiries and loan payments. During off-hours, the machine functions as a Smart ATM allowing cash and check deposits as well as withdrawals. UCU unveiled its first video teller in July 2016 at its Farmington location. Today, the credit union has seven ITMs around the state, including Maine Maritime Academy. To learn more about UCU’s fleet of interactive video teller machines, visit www.ucu.maine.edu/locations/.